Home » News » Ladies…Give us your support! Give all your old bras a new lease of life and help Hopscotch raise money for breast cancer research. Deposit your unwanted wearable bras in our BRA BANK at Hopscotch Nizells Avenue and they will be whisked away to Africa where there is a short supply of affordable bras. 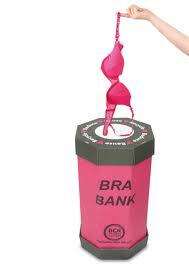 Against Breast Cancer will receive a donation based on the weight of bras we collect – so every bra counts!